Entries in the table of contents in “Building Blocks of SketchUp” are active links. When you write and publish a book independently, you don’t need to worry about the bean counters or the salesmen. You can do what you want. In “Building Blocks of SketchUp” I tried to write the book I would have liked to have when I was learning SketchUp. One of the things I struggled with was what each of the tools did and how they did it. I’m getting closer to releasing this new guide to the basics of 3D modeling in SketchUp, and this screenshot shows what the table of contents looks like in Adobe Reader. Each entry in the TOC is an active link, so one click on the text takes you to that page or video. Adobe Reader can also display thumbnail views of each page, that’s what you see on the left of the screen shot. Those are links too, so click on a thumbnail to go to that page in a flash. Sure beats leafing through a printed book to find page 178. A lot of SketchUp rookies share the problem I had with learning the specific functions of tools, so I added a book within a book. At the end of the text is what I call the “Basic Tool Guide” for the most used tools in SketchUp. The Basic Tool Guide is 47 pages with short 2, 3, or 4 page sections that explain how specific tools work, what to watch out for to stay out of trouble, and special features you may not have noticed. This is a screen shot of the first page of the section that covers Push/Pull. 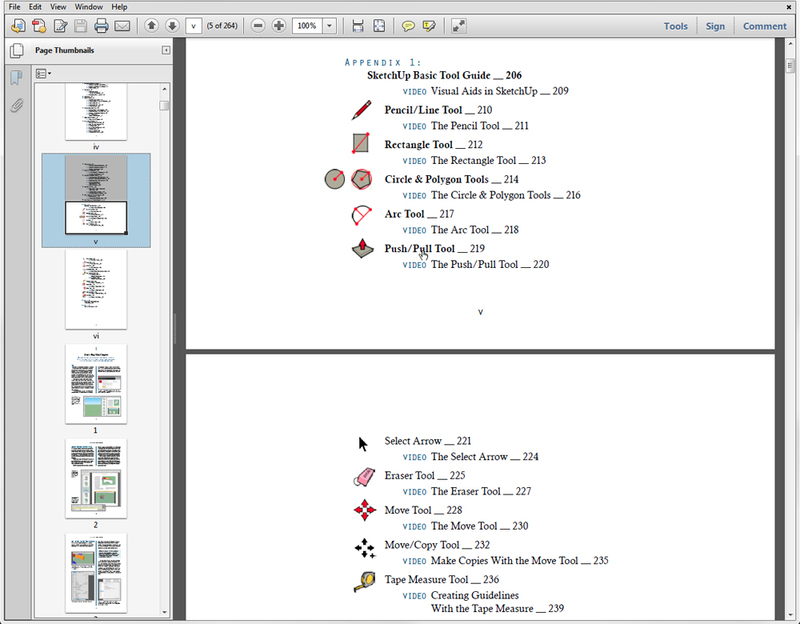 In Adobe Reader, I switched the view in the left hand pane from “Pages” to “Bookmarks”. Bookmarks are another way to make information on specific topics easy to find and fast to get to. These too are links and the text entries are chapter headings and subheadings. There is also a bookmark for each of the 50 or so short videos embedded within the text pages. There isn’t any substitute for seeing what button to push, where to move the cursor or what to click on when you’re learning SketchUp. 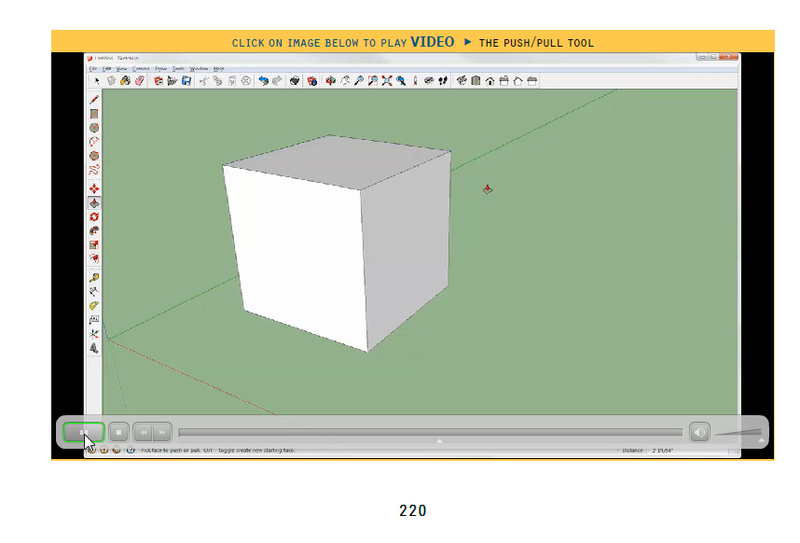 In “Building Blocks of SketchUp” videos are right there within the book and a simple click with the mouse turns the video on. Hover the cursor over the video and controls magically appear so you can rewind, pause or fast forward. 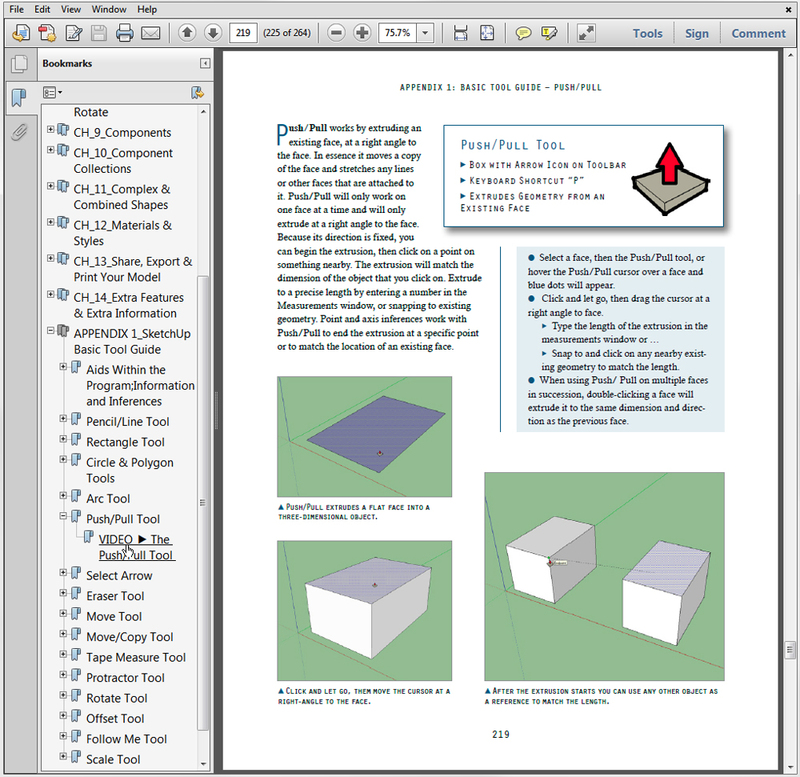 Videos are embedded within the PDF in “Building Blocks of SketchUp” to reinforce the text lessons. They are easy to find and return to if you need a quick refresher. The image at right is a screen shot of the video in the Push/Pull section of the “Basic Tool Guide” included in my new book “Building Blocks of SketchUp. We’re wrapping up our final edits and getting ready to offer the entire book for sale. In the meantime, I’ve uploaded the Push/Pull pages from the “Basic Tool Guide”. Click on the link at the end of this post to download it and take the enhanced PDF format for a test drive in Adobe Reader. “Building Blocks of SketchUp: A Comprehensive Digital Course in the Fundamentals of 3D Modeling with Video Tutorials Embedded Within the Text” is now available as a download in enhanced PDF format. It will be available as a physical copy on a disc delivered via the US mail. in the next view weeks. I think you’re going to encourage many, many people to learn SU, with the help of your ‘tutorials’, who otherwise might be intimidated to even begin. If this sample is any indication of the organization, thoroughness, and clarity of the rest of this work, then not only are you making a significant contribution to the ‘graphics’ community.by training scores of people, many of whom would not have become involved otherwise. but you should sell a gazillion copies. I surely hope so! This will be terrific! Congratulations – what a wonderful way to encourage others to use SU. The sample file is clear and concise, in a beautiful layout. Classic Lang! Bob, The sample looks very interesting. I can’t wait to get the full copy. One suggestion, if its not too late, would be to look at changing the font. I found the current font very difficult to read. I agree, the font is difficult to read. The font you used on this page it’s much easier to read. It’s too late to change the font, and I trust my designer on things like this. One of the things you can do in Adobe Reader is make the page larger so it’s easier to read on screen. i think after spending 30 bucks to get this a little instruction on how to start the program would be nice. I get the cover page but can’t move beyond it. what do I need to do. Did the entire file download? It can take awhile, and you may have tried to open it before the download was complete. Are you opening the file in Adobe Reader? The book is in PDF format, and you may be seeing a preview image from your computer, or your machine may be trying to open it in something other than Adobe Reader. Send me an e-mail and we’ll get it working for you.